Like a rolling stone, humble whirlwind Pope Francis has been meeting and greeting the mighty and powerful of the USA, addressing President Obama, the United Nations and the US Congress, who still turned up to his address even though he cancelled his lunch with them at the last minute to dine with the homeless. One can only wonder at how the Pope can cancel a lunch appointment with foreign dignitaries at such short notice (completely unplanned of course!) despite all the effort many staff will have gone to to prepare to greet him and show him hospitality, while publicly throwing them under the bus by making it know he fancied spending his time with other more humble, lowly types, and - despite this - his glowing reputation actually grows in stature. Obviously, if you or I arranged to meet someone for lunch and said, at the last minute, "Actually, I'd rather dine with some tramps I've just spotted," your hosts or mine would be equally impressed. If I rang round my friends and told them what I had done and told them to tell everyone they knew that I had done it, they'd never think I was up myself or in any way arrogant. Most people with poor manners lose friends, but Pope Francis, amazingly, gains them. Out of character for Francis, though, his growing admirers were witness to pre-written speeches, carefully crafted in order to lay out his bold 100 year plan for the future of all mankind, a vision that will sit fairly comfortably with that of the UN's population controllers, but which is Christless enough to irritate a number of Catholics. His speeches were sometimes in English and sometimes in Spanish but anyhow, so many people were unable to digest some of Pope Francis's eloquent 'off the cuff' uses of language, usually delivered to Christians, in order to hurl accusations and insults at straw men characters who may or may not be in the room at the time. Some of the US's most prestigious music magazines are therefore promoting an exciting box set of Pope Francis's insults collated from over two years of speeches and homilies. 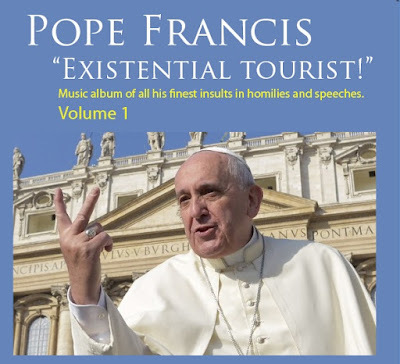 The 'Pope Francis Album of Insults', set to garage, electronica, trance, hip-hop and ragga (basically, anything but Gregorian Chant) will be available at Christmas and some are expecting it to reach the summit of the Album Charts in the United States and Europe. "There is also a “spiritual Alzheimer’s disease”/The disease of existential schizophrenia/The disease of gossiping, grumbling and back-biting/The disease of idolizing superiors/The disease of poor coordination/The disease of excessive planning and of functionalism/Then too there is the disease of mental and spiritual “petrification”/The disease of thinking we are “immortal”, “immune” or downright “indispensable”, neglecting the need for regular check-ups/The disease of a lugubrious face/The disease of rivalry and vainglory..."
"We'll do whatever it takes to get our man to the top, by hook or by crook, we don't care. This is rock n' roll after all. Rules are for losers. If me and my mafia mates can organise a dodgy conclave, I think we can manage rigging the album charts. I've got powerful friends, you see. Look, I'm going to throw a TV out of my hotel room. Security, will you let me know when Edward Pentin is standing directly under my window? Cheers! Wait...I didn't say that! You'd best forget I said that. You don't want a horse's head in your bed do you? Good, well you best shut it then." Due to the sheer number of incredible papal insults Catholics have come to endure, know and love - and want to share with those around them - the Pope's record label will be releasing an 11-track volume of insults set to a variety of musical styles every 4 months for the next ten years. At the end of that the box set will be available for a renaissance princely sum of just £99.00. All proceeds of the sales of his insults set to music will go to his personal charities for the poor and homeless. Oh dear. Can I suggest that you take some time away from this blog to reflect and pray in silence. Well, I managed about an hour. You haven't lost your Catholic or common sense, dear brother in Christ. Thank you for some relief from the diabolical that people are being told they must joyfully accept because it comes from the Holy See. God bless you and your wife. Bwa ha ha ha! That's the Bonester I love!!! I think the pope’s missing a trick here. He could offer a plenary indulgence (under the usual conditions, confession, communion, praying for his intentions, absence of an attachment to venial sin etc) to anyone who buys the album. Whaddya think? On second thoughts, maybe not his style. Actually, I hear he considered inserting a bonus track for the Year of Mercy, a cover version of “It’s a Sin” by the Pet Shop Boys, but he thought it might sound a bit judgmental. A boor is always a boor even if he's in white cassock......let's pray for our souls. I laughed hard at that title: "Existential tourist"! Can't believe Francis actually said this (googled it - he did). Sounds just like some low-rent 80s prog rock 13 minute album track too. Brilliant Bones! Listened to the opening song on Icloud. Sounds like a white guy with an Afro and heavy mustache, wearing several gold chains and smoking a e-cig---produced the album. I get the feeling your just a teeny weeny bit irritated Bones? What about a cover of It's a shame by Talk Talk?